It’s been 30 years now that Pierre and Sophie Larmandier have directed Larmandier-Bernier, which has been one of my favorite Champagne growers in the Côte des Blancs for many years. Biodynamic since 2004, the family cultivates a total of 15 hectares in the grand and premier cru villages of Vertus, Oger, Avize, Cramant and Chouilly. The grapes are picked at a high ripeness level and fermented with indigenous yeast in smaller and larger oak barrels including foudres but also in stainless steel. 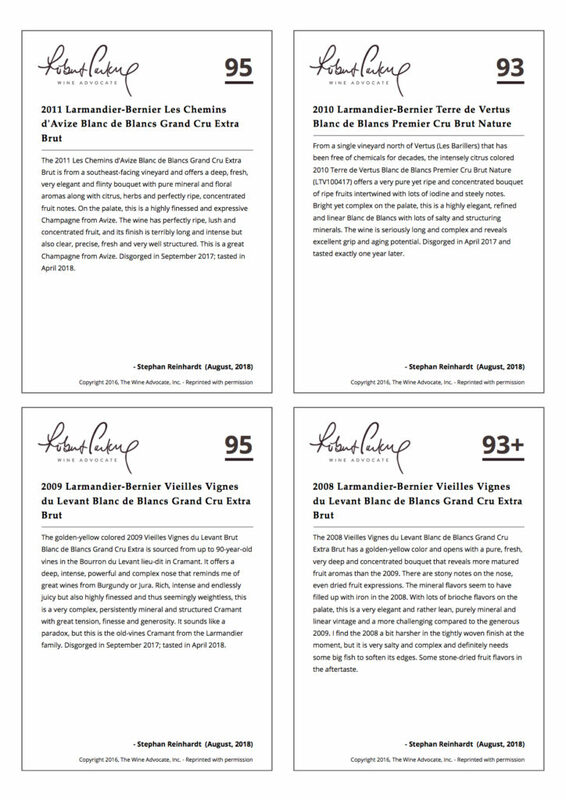 In a vintage such as 2009, some wines like the Vieille Vigne du Levant can be entirely fermented in oak, where it is kept until July before it is bottled unfiltered for the prise de mousse. 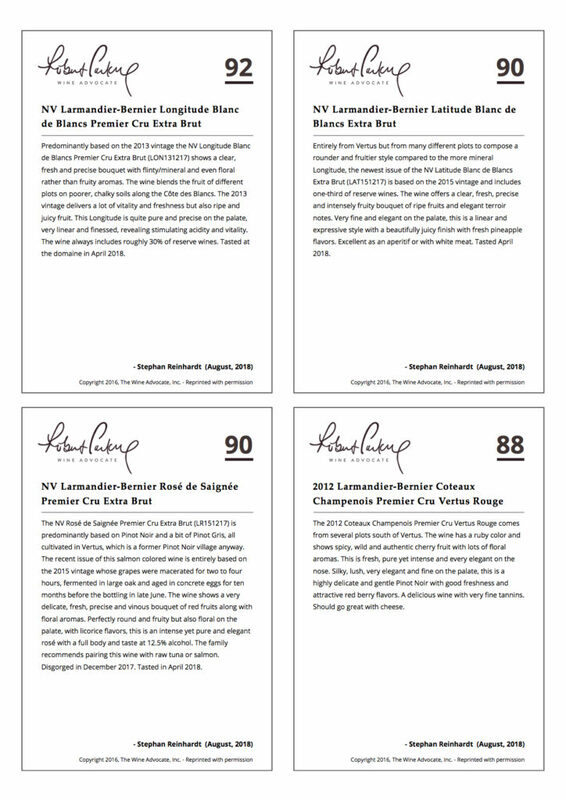 All the cuvées from L-B are connected to specific terroirs and thus represent different characters. Latitude, which is predominantly from Vertus, is more round and charming compared the Longitude, which comes from purely chalky soils of several origins and delivers a more tensioned and structured cuvée with a chalky expression. 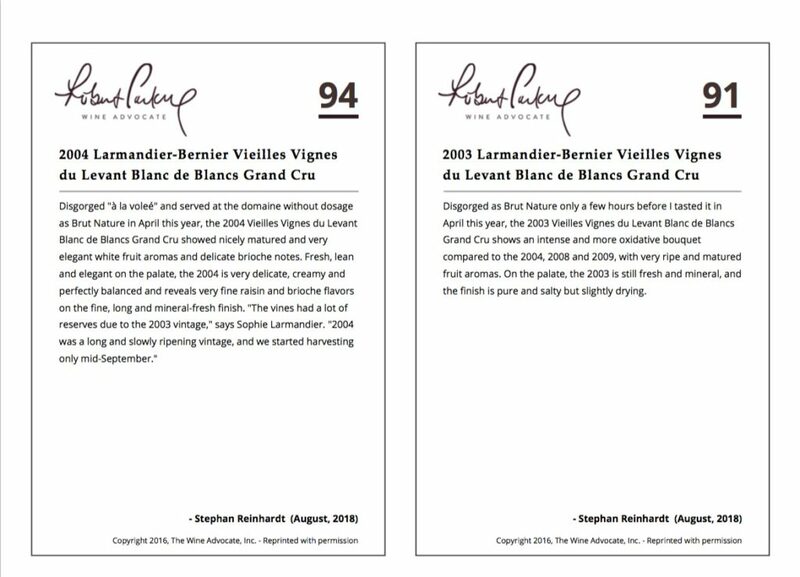 The Longitude and Latitude wines are non-vintaged, but the wines with a designated origin on the label are vintaged. Terre de Vertus comes from the poorer chalk soils north of Vertus and is full of energetic vibration. The two top wines of the domaine come from old vines in Avize (Les Chemins d’Avize, of which the 2011 is amazing!) and from up to 90-year-old vines in Cramant, which deliver the impressively structured and tensioned Vieille Vigne du Levant. From the clayey southern part of Vertus, the Larmandier family produces a fine red Pinot Noir Coteaux Champenois as well as the remarkable Rosé de Saignée Champagne, which contains some Pinot Gris as well and is worth a try!